Although Port Hedland continues to be the engine room of the Western Australian economy, the busiest port in Australia and the biggest minerals exporter, its economy is suffering. House prices have dropped by 50% and rents significantly more than that. The tonnage through the Port Authority is still at record highs, but this has not saved the town from the boom bust cycle. After experiencing three booms in the 1970s, 1990s and 20tens, it would be fair to say that Port Hedland’s prosperity is driven by construction booms, not export tonnage through the port. Tonnage does not offer more jobs and employment security. Jobs are lost after each construction boom due to advances in technology and efficiencies. Port Hedland’s economy can be secured with a diverse range of products and services. The next boom will probably be in agriculture. The port is well positioned for this and to host cruise ships and the tourism that comes from that. 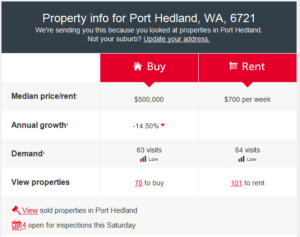 In the meantime, Port Hedland is offering some bargain properties at the right price in readiness for the next boom.